Interact Center gets ready to perform Madame Majesta's Miracle Medicine Show at the Lab Theater in Minneapolis. Playwright Dawn Brody draws parallels between old-time medicine shows, where society's outcasts could earn a living performing, and the actors and artists of Interact Center for the Visual and Performing Arts. Interact Center is a professional theater company whose mission has been to challenge the public's perception of people with disabilities since 1996. 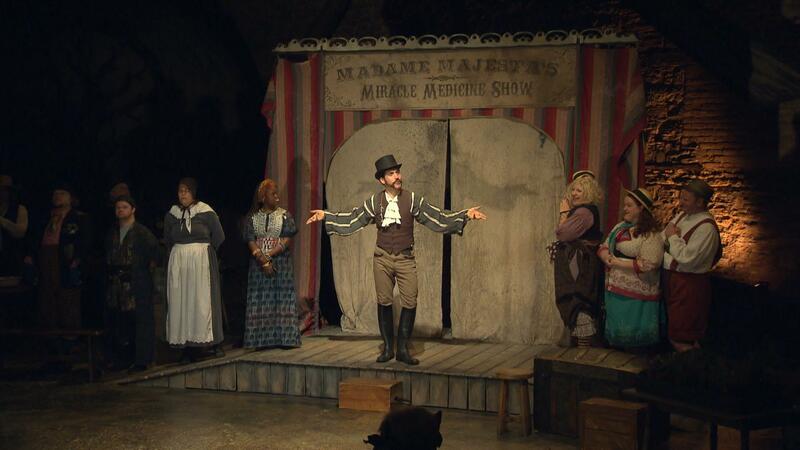 Interact's trained actors, most with physical and mental disabilities, star in Madame Majesta's Miracle Medicine Show, about the outcasts in 19th century traveling side shows. Organization Bio: Since 1992, Interact Center has been a professional theater company that has included people with disabilities. Today it remains the only professional theater company nationally to work with and train actors with physical and mental disabilities. Their mission is to bring new life to the arts while challenging society's view of disability. Interact Center uses theater to challenge perceptions of people with disabilities.